This is a test of inserting a picture into this new topic. I think I figured it out. The two bottom magazines are the 1894 early magazine tubes from 1961 - 62 that slide out when the plug screw on the end either breaks or comes loose and the threads on the barrel clamp screw scratch the tube as it slides past. This is caused by firing the gun and generating a jolt with a feed tube full of bb's and the tension on the feed tube spring pushing forward on the magazine. 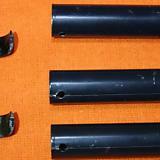 Daisy drilled a hole in the magazine tube and put a pin in the inside of the barrel clamp to remedy this problem as shown in the picture on the top. I've found a couple of guns that has the newer clamp installed on the barrel with the pin and the old original magazine with no hole in the tube, causing a gap in the ends of the clamp. This is the way the first picture should look. I had cropped it a little to much. I'm not familiar with the 1894 but the photos show the effectiveness of Daisy's repair for the problem. Good job on the photos, too. Thanks Cobalt327, it took about an hour of playing around before I got it, then went back to get another picture and forgot the sequence because I tried so many and then found it. Everyone talks about how difficult the 1894 can be to work on and even though there has been some very good info posted here, I'm sure that will be welcomed.